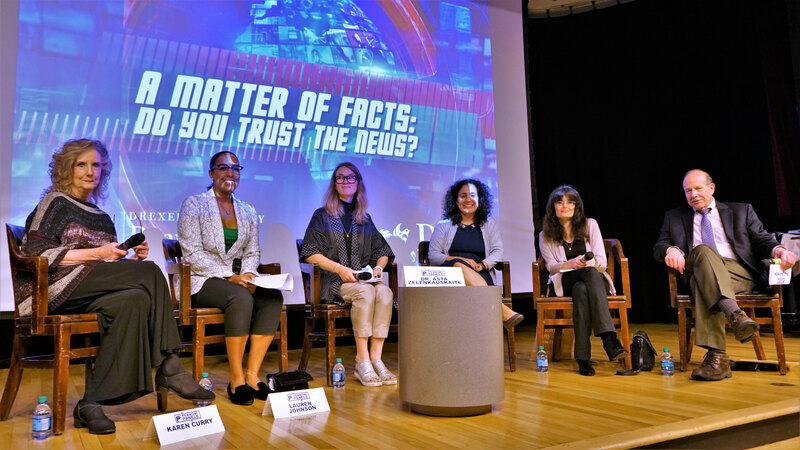 Combating the uncertainty of “fake news” was the focus of a panel held by the Pennoni Honors College May 17 titled “A Matter of Facts: Do You Trust the News?”, which featured five industry experts as part of the Week of Undergraduate Excellence. Moderated by assistant professor of communication at Drexel University Asta Zelenkauskaite, the panel included Karen Curry, an adjunct professor in the Antoinette Westphal College of Media Arts & Design with extensive experience in broadcast journalism; Christine Flowers, an immigration attorney and opinion columnist for Philadelphia Daily News; Lauren Johnson, anchor of Good Day Philadelphia Weekend Edition on FOX 29; Michelle Ciulla Lipkin, the executive director of the National Association for Media Literacy Education; and Bill Marimow, a two-time Pulitzer Prize recipient who is the vice president of Philadelphia Media Network. Before a lively discussion on fake news began, Paula Marantz Cohen, dean of the Pennoni Honors College, provided opening remarks that prefaced the importance of tackling contentious topics through annual Pennoni Panels. Zelenkauskaite, an avid researcher of media studies and emerging practices in online environments, initiated the discussion, noting the chaotic nature of fake news and how the notion of information warfare allows countries to push their agendas through online news portals and other social media platforms. After panelists gave introductions that encompassed how fake news has impacted their careers, Zelenkauskaite then inquired about the essential journalistic pillars each panelist upheld and the interplay of these values with fake news. “You need to report, you need to report the facts, you need to talk to many sources, you need to learn as much background on a story as possible — and then you as the reporter or writer of the story — you synthesize it,” Curry said, advocating for a holistic journalistic approach. However, the panelists then discussed how these backbones of the practice are changing as journalistic interactions are becoming less personal. Marimow expressed how the arduous tasks of journalism are now being done with ruthless efficiency, as younger journalists veer towards virtual interviews, which he considers one of the real pitfalls of the modern era of journalism. Ciulla Lipkin suggested that this transformation was also due to the business structure of journalism, explaining how the field is widely understood to begin with. Despite these changes, Marimow emphasized the importance of learning to master both sides of every story. Johnson added that it is important to speak up in the newsroom to uphold personal principles against conflicting network obligations. Zelenkauskaite then directed the conversation towards the distribution of fake news and the relationship between the platform versus the content of messages. Ciulla Lipkin argued that part of the issue that we are dealing with as a culture is the sheer speed and quantity of information. The panelists said the main proliferation of fake news occurs through social media channels, although they distinguished that fake news is not necessarily fake; rather, the phrase denotes personal opposition to ideas, often nursing the separation between political parties. Flowers, who says this revolves around the idea of confirmation bias, explained how opinion writing has blurred the lines of reality for many readers. Zelenkauskaite asked panelists if their work experience has changed because of fake news, and Flowers noted how the debate over fake news has become deeply personalized. “Twitter has become a bloodier battle than Gettysburg,” she said. However, Marimow explained how Trump’s denouncing of news organizations has led news organizations to repudiate in much blunter language than ever before. “To me, it’s both laudable — because I think it’s important for the public to know the truth — but it’s also momentable because of the crassness that has been injected into our public dialogue,” he said. The conversation between the panelists then shifted to public framing more generally. Johnson explained how there is now a broader panel of people to speak about issues, although Ciulla Lipkin argued that this has made it difficult to distinguish between hard news and mere judgment. This comment paved the way for a discussion about how to stop fake news from spreading. While Curry advocated for increased regulation within the industry, Ciulla Lipkin said that education is the answer. Marimow agreed, asserting that current events should become more widely accepted throughout curriculums. “I would start again at the elementary school level and incorporate current events into every curriculum across the United States — public school, private school, Catholic school — and really educate students in the importance of being an informed citizen,” he said. Ultimately, he said that understanding the world — and being able to differentiate between what’s fake and what’s real — is crucial in determining how we function as a society overall.